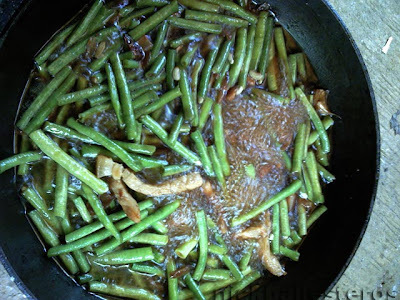 This is one of the simpler adobo recipes, as it involves no-fuss string beans as the main ingredient. But no matter how simple it is, adobong sitaw is a favorite with piping hot rice. Plus, it's quick and easy to cook! 1 bundle string beans, ends removed of the string that stretches across its spine and cut to bit-size. Place pork in pan over medium heat. Submerge in water and cover. Simmer til water disappears and pork starts to cook in its own fat. Add cooking oil if needed. Add garlic and fry til golden brown, then add the onion. Add the string beans, then pour in water to nearly submerge the beans. Add soy sauce (depends on taste). Cover and simmer til string beans are cooked. Not too soft, just enough for the fork to pierce it and still provide a fair amount of resistance to the piercing.